The summer trip was Vietnam Health Clinic’s second time having an optometric component. Being purely a non-profit and student led organization, our resource in supplies and manpower is mainly based on the support of the community, especially organizations as yours. This year, the total number, of readers, glasses, sunglasses, and frames that were donated to VHC, was approximately 10,600 pairs. These donations come from EYEsee, The Lion Club, Restoring Vision, Frame the World, and many other generous organizations, doctors, friends and families. Volunteering with us on the trip, we had two optometrists, Dr. Amenda Chou, Dr. Cindy Than, one ophthalmologist, Dr. Eric Tu and one optometric student from Pacific University, An Pham. This year, we visited the rural areas of Cantho, Soctrang and Travinh, three small towns located along the Mekong area of Vietnam, from August 23rd to September 8th. We set up 8 clinic days, and provided eye exams for children and adults who were over forty years old. Over all, the whole clinic saw more than 2,200 patients and Optometric component gave eye exam to approximately haft of them. We gave out about 1,700 pairs of reading glasses, and all of our patients went home with at least one pair of sunglasses and, of course, a happy smile on their face. In addition, we visited three orphanages and gifted about 500 pairs of kid sunglasses. The leftover glasses are stored in our storage of Vietnam for our next trips. We would have not been able to provide our patients the great amount of readers and glasses without your donation. On behalf of Vietnam Health Clinic, I would like to sincerely thank you so much for being one of our main donors. Progressing on to 2014, we hope to carry our momentum and your support from last year to accomplish even greater goals! Thank you once again! Wish you all a warm and happy holiday season! For additional info about Vietnam Health Clinic, contact (206) 331-2539 or mail Vietnam Health Clinic 325 9th Avenue, Box #35990, Seattle, WA 98104. 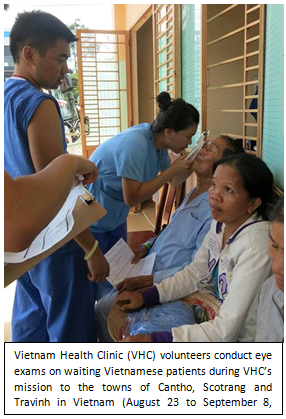 Mansalay Foundation for Youth Development held eye clinics in the small towns of Roxas and Mansalay in Southern Oriental Mindoro province. Our patients were initially examined and measured for the eyeglasses that they need and most of the patients require lens for nearsightedness. We hired a local optometrist who determined the focal strength of each lens as well as the grades of patients’ eyeglasses. 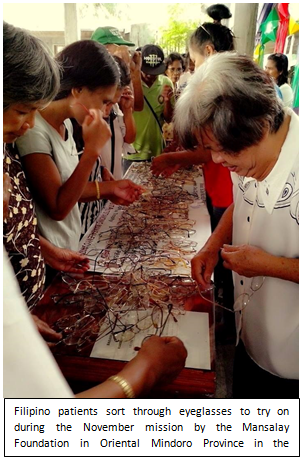 During a span of three days, 800 patients were examined, measured and received their eyeglasses. In addition, we distributed eyeglasses and sunglasses to the people in the small barangays in neighboring towns. We have about 200 eyeglasses as leftovers after our mission. We expect to give them out during our mission to the Mangyan communities. They are the local ethnic group in Oriental Mindoro. I have included photos of our mission in the towns of Roxas and Mansalay. We are so very thankful to EYEsee for trusting our organization. Shannon Dowd, a junior at Bethpage High School in Bethpage, New York, contacted EYEsee last November after reading about the organization. She wants to contribute to an organization that helps others who have vision problems. For Shannon, who plans to pursue a career in either ophthalmology or optometry, this was a personal mission as well. Shannon was born with a condition called delayed visual maturation, and she had no vision until she was more than six months old. Her parents have always spoken to her about it and how anxious they were that she might not get her eyesight. Having worn eyeglasses since she was a year old, Shannon feels lucky to be able to see well all the time because of the availability of eye care. She feels compelled to help others who have poor eyesight but unable to afford a pair of eyeglasses. During the months of November and December, Shannon organized an eyeglasses collection drive in her neighborhood. Recruiting her friend Isabella Bradley who is also at junior at Bethpage High School, Shannon had her team. The team created a flyer to announce their collection drive and generate excitement about their project. They distributed their flyer letter throughout their school and then set up collection boxes around the school. They walked their neighborhood and left 500 flyers in the mailboxes and with local businesses. Their flyer requested people to leave their donated eyeglasses in their mailboxes. Shannon and Isabella came later to pick up the eyeglasses. Shannon and Isabella also emailed their family relatives and friends about their service project, asking them to support it and spread the word about it. They visited senior complexes and invited residents to donate their unused eyeglasses. They set up collection boxes in their church and in the town firehouses. Running their collection drive during the holiday season, Shannon and Isabella put in more than 50 hours for their project. While the team originally hoped to collect about 200 eyeglasses, their neighborhood responded generously to their collection drive. After counting all the collected eyeglasses, the team tallied a final count of 600 eyeglasses.